WHEN YOU VOTE in the referendum to repeal or retain the Eighth Amendment tomorrow, don’t be confused by what you see written on the ballot paper. Although the referendum focuses on the amendment that was introduced back in 1983, it is actually a vote on the 36th Amendment to the Constitution. That has been lost in the noise of the debate, as so much focus is placed on the Eighth. The ballot paper you receive tomorrow will only mention the 36th. Here is the sample ballot paper, as distributed by the Referendum Commission. Thirty-sixth Amendment of the Constitution Bill 2018. This refers to a very short and simple piece of legislation. Click here to read it for yourself. That’s it. The 13th and 14th Amendments are not required if the Eighth Amendment is repealed. This vote does not deal in any way with the proposed legislation that would govern the circumstances of where abortion would be allowed. 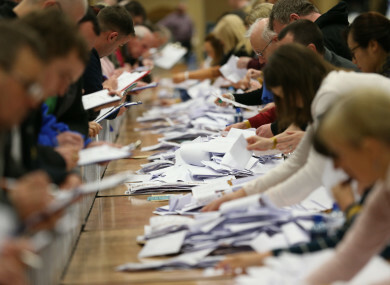 Speaking ahead of Friday’s vote, Dublin city returning officer James Barry advised voters to remember to mark their ballot paper with a single X and nothing else. Barry added that occasionally people will attempt to put their initials on votes, but as this makes them potentially identifiable to other people – thus invaliding the secrecy of the vote – they will not be counted. He said that badges and jumpers could be acceptable – and that impersonation officers from either campaign might be seen wearing them within the polling stations – but that it’s all based around the potential disruption they could cause, which is up to the discretion of the presiding officer. Barry stressed that everyone should bring ID, and to be even safer, proof of address. If there’s a big queue, having [proof of address] can help keep things moving. Barry added that if anyone wishes to pop in to a polling station to observe proceedings and see how it all works, they will generally be welcome to do so. Email “Don't be confused at the ballot box - you're voting on the 36th Amendment tomorrow”. Feedback on “Don't be confused at the ballot box - you're voting on the 36th Amendment tomorrow”.